Yeshiva students who are not accustomed to regular drinking may be more susceptible to minimizing or even ignoring their impairment when it comes to driving. No one should drive or attempt to operate a vehicle if s/he had anything to drink on Purim. College campuses have a similar problem when it comes to spring break, a period of time where many students engage in behaviors they normally would not consider. One solution on a number of college campuses is to offer a Drunk Driving Pledge to prevent students from drinking and driving. Students are encouraged to sign the Pledge, and are offered an entry into a Raffle for doing so. Drunk Goggle demonstrations, which simulate the impairment of drunkenness and can be a powerful illustration of the dangers of drunk driving, often accompany the Pledge drives. For an additional raffle entry: I will encourage my friends to sign the Purim Pledge. It’s a simple idea, but, coupled with organized Pledge drives on the local level it can save lives on Purim. For more information about the Pledge, or to help bring it to your community, please email chaimshapiro@ aol.com. King Salomon is the new kosher fast food restaurant (fleishig) which recently opened in Moscow, Russia at the AFIMOLL shopping center, in the city’s new Moscow-City business district. It is certified by Rabbi Berel Lazar, Chief Rabbi of Russia. The restaurant’s menu features Israeli cuisine, including falafel, hummus, hot pita, sandwiches and baguettes, as well as a variety of vegetable salads. Australia requires kosher slaughter to stun animals after shechita . Until now there has been an exemption for sheep where no stunning is required. Australian animal rights activists are protesting in rallies against continuing to allow shechita of sheep without any stunning. In the U.S. kosher meat is not stunned even after the shechita. By and large the Orthodox community in Europe and the US does not accept stunning even after the shechita process. The IDF Rabbinate is working to improve the standard of kashrus in the military, planning to bring most military kitchens to a mehadrin standard in the coming years. Today, the majority of products used have a mehadrin hechsher. BaMachane, IDF’s weekly, reports that mashgichim in the IDF will enter a course similar to one given to mashgichim employed by the Chief Rabbinate’s local religious councils. The goal is to raise the level of kashrus in the army to a standard high enough that everyone will be able to eat. This will require mehadrin products (especially meat, which till now was not mehadrin), modifying many kitchens, kashering utensils, pots, implements, stoves, etc., and, most of all, maintaining a regular staff of qualified mashgichim to ensure that the desired level of kashrus is upheld. According to Rabbi Lt.-Colonel Rafael Amar, who is in charge of kashrus in the military, 40% of the IDF’s combat troops today are yeshiva students, many from hesder yeshivos, and there is a growing demand for mehadrin kashrus. Mehadrin kashrus in Israel is being demanded by increasing numbers of people. Today, there are 160 mashgichim in the career army, in addition to hundreds serving in mandatory service. IDF Chief Rabbi Brigadier-General Rafi Peretz hopes to attract more frum soldiers to serve in this capacity in the hope of one day declaring that the IDF’s food is under the supervision of Badatz IDF Chief Rabbinate. Kosher Veggie "Meat" is now in IDF military meals. Chef Man is a new kosher meat-free line of soy-protein beef and poultry style products. Israel's soldiers are already eating it. If it looks like meat, tastes like meat, but isn’t meat – it’s soy. Chef Man contains no dairy, sugar, eggs, or wheat products, and is also gluten free. Chef Man plans to sell in the U.S. within the next few months. On a separate note, the IDF recently inaugurated the first military mikvah at the Air Force southern base in Ovda. This was due in a large part to a $100,000 donation. The closest mikvah until now was in Eilat, 37 miles away. 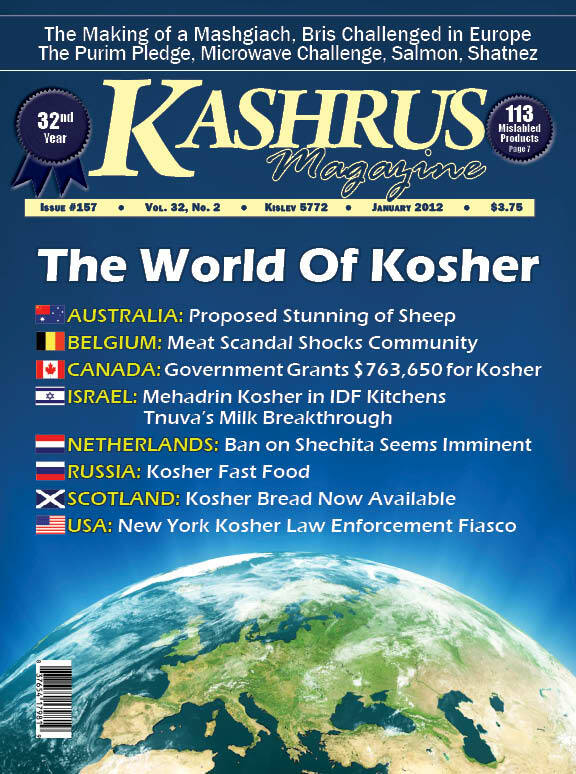 To see more "World Kosher News", click "Subscribe" at the bottom of this page. There was a time when people said, and kashrus agencies believed, that all fish with red flesh were salmon. Therefore, they opined, salmon does not need fins and scales in order to be identified; their color gives them away. Indeed that may have been true at one time, however, today, kashrus agencies agree that the red color of fish does not guarantee that they are salmon. Today, many fish are given astaxanthin, used as a vitamin as well as a coloring agent, which affects a red color in flesh of the fish, red enough to fool most people into thinking that the fish is salmon. While there may be experts who can identify salmon and are not fooled by an artificially-produced red color, for most people it would be impossible. Even salmon, especially farmed salmon (which is not naturally red), are fed astaxanthin to help them achieve a red color which will affect their sales price, as consumers look for the redness in their salmon. Unscrupulous vendors in Thailand have been selling meat of the deadly puffer fish disguised as salmon, causing the deaths of more than 15 people over the past three years. The puffer fish is dyed to look like salmon. The reddish color of the fish misled many into thinking that they were eating salmon. Although banned since 2002, puffer fish continues to be sold in large quantities at local markets and restaurants in Thailand. In Japan, the puffer fish is called fugu, where it is consumed by thrill-seeking Japanese gourmets for whom the risk of poisoning adds piquancy. There is no known antidote to the poison. Fugu is the Japanese name for the Pacific Ocean Native Fish. It is a member of Tetraodontoid family. These types of fish are extremely toxic and they tend to expand their bodies by up to an astonishing 300 times. We call them blowfish or balloon fish. They have a unique ability to puff their bodies and expand, and some even have razor sharp spikes that come out for their protection. This fish is considered a delicacy in Japan. There are lots of fans of fugu, people who love adventure and who eat this poisonous fish; yet many have died from eating it. It requires over 30 steps to prepare fugu fish, these preparations rendering the tetrodotoxin milder and edible. Still, it still had killed a large number of people. There are between 30 to 100 cases each year where people die eating this poisonous fish. Tests reveal that the mislabeling of fish is very common. Scientists aiming their gene sequencers at commercial seafood are discovering rampant labeling fraud in supermarket coolers and restaurant tables: cheap fish is often substituted for expensive fillets, and over-fished species are passed off as fish whose numbers are plentiful. Recent studies by researchers in North America and Europe harnessing the new techniques have consistently found that 20 to 25 percent of the seafood products they check are fraudulently identified, fish geneticists say. Labeling regulation means little if the “grouper” is really catfish. In fact, the National Seafood Inspection Laboratory (NSIL) routinely examines seafood products for substitution. Over the 9 year period of 1985-1997 they found that 37% of the fish were mislabeled. At present, 80% of the red snappers tested have been mislabled. Environmentalists, scientists and food experts are complaining that regulators are lax in policing seafood, and have been slow to adopt the latest scientific tools even though they are now readily available and easy to use. “Customers buying fish have a right to know what it is and where it’s from, but agencies like the FDA are not taking this as seriously as they should,” said Michael Hirshfield, chief scientist of the nonprofit group Oceana. Policing the seafood industry has historically been challenging because even the most experienced fishmongers are hard pressed to distinguish certain steaks or fillets without the benefit of scales or fins. And many arrive in supermarkets frozen and topped with an obscuring sauce. Help is on the way. As mentioned in KASHRUS, a hand-held device suitable for checking the DNA of a fish should be in use in 18 months or so. Thank you for your letter of October 18 in answer to my letter of September 1, 2011. I had addressed my letter to the Governor, as only he is capable of affecting the rehiring of the nine kosher law inspectors who were laid off. Unfortunately, the letter sent by the Commissioner does not address the two questions which I had raised in my letter. For that reason I am repeating those questions together with several more. 1. In the first 6 months since state safety inspectors were charged with “also” monitoring kosher disclosure, there were less than 5% of the inspections (now called compliance visits) of the previous year when the kosher inspectors were working for the department. Would the Commissioner kindly provide us with the number of compliance visits made since the program of kosher law enforcement has been handled by New York Sate safety inspectors, and the number of compliance visits done the year before, when the job was handled by the Kosher Law Enforcement staff. 2. We would also like to know what is being done to handle those producers and merchants which were serviced by Kosher Law Enforcement, but which are not on the books of safety inspection. 3. How are the safety inspectors checking the representation of companies in their kosher claims and disclosures? Despite what the Commissioner wrote in his letter, the job of Kosher Law Enforcement is not just to register businesses with the correct kosher certification, but rather to ask companies to disclose exactly what their kosher program entails. How can safety inspectors, who are burdened with one set of responsibilities and who have only a “light exposure” to kosher, able to determine whether a company which makes detailed kosher claims on the disclosure form, is in compliance? 4. The decision by Judge Nina Gershon that the New York State Kosher Law is constitutional should be a “game changer”. There need no longer be a fear that the efforts of the department will be interrupted by legal challenges. KASHRUS Magazine’s 30,000 readers await your reply. P.S. Rabbi Luzer Weiss is a highly respected professional, but one man cannot do the job of ten. To see the rest of this article, click "Subscribe" at the bottom of this page.